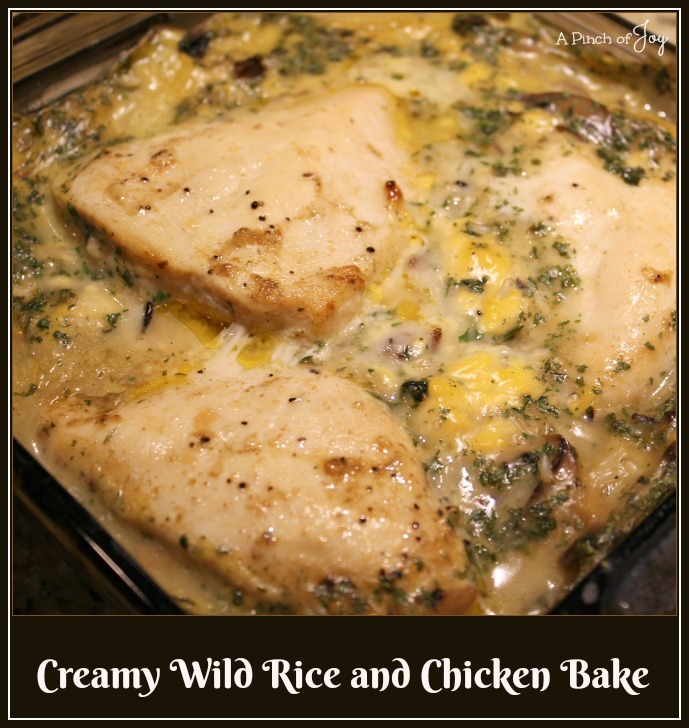 Creamy Wild Rice and Chicken Bake is delicious, filling comfort food. It is easy to assemble in about 5 minutes. Make the rice mixture in the morning to refrigerate with the thawed chicken in a separate bag. 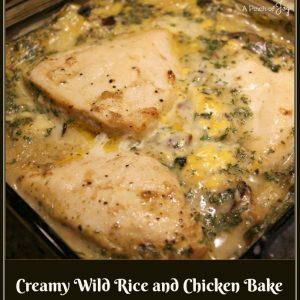 The minute you walk in the door, put the chicken on top of the rice, add the slivered almonds and it is ready to pop in the oven. Sit down for the next forty five minutes or put in a load of laundry, clean the cat box, referee homework and sit down for five minutes! Whatever you need to do! With ten minutes left on the timer, fill bowls with a salad mix from a bag, microwave a steam in the bag vegetable and set out a plate of cookies. Very happy tummies for not much time invested. I use Uncle Ben’s Long Grain and Wild Rice with a seasoning packet. The package says it will make three servings but with the chicken and soups, there is plenty for four servings. The recipe does NOT call for salt because there is salt in the seasoning packet. Choose low sodium soups if salt is a dietary issue in your house. Sprinkling black pepper or lemon pepper on the chicken breast before baking adds a nice touch of flavor. You can also very lightly drizzle a bit of olive oil over the chicken breast before adding pepper and baking. Rice will be slightly brown around the edges when done. I try to choose thinner pieces of chicken breast – about half an inch thick- because they will bake in an hour. Thicker (an inch or so) chicken breasts can take longer to cook through and it’s better to use a thermometer to confirm that they reach 165 degrees and are done. Quick to assemble -- make in the morning and pop in the oven as soon as you walk in the door for a filling comfort food meal that will make the whole family happy! Pour rice into medium mixing bowl, add seasoning packet. Pour in cream of chicken and cream of mushroom soup plus one soup can of water. Drain mushrooms and add to bowl. Stir mixture well. Bake uncovered for 1 hour to one hour fifteen minutes. Rice should be tender and chicken should be 165 degrees. Yum!!! Another delicious and hearty dish!! Come ink up with us again over at The Blended Blog!!! Is it too early to prepare this, the pictures have me salivating!! Not too early 🙂 Thanks for the invitation –linked and added your party to my master list!